Regent of England, earl of Pembroke and lord of Striguil (Chepstow Castle), tutor in arms to Henry the Young King, and above all epitome of loyalty and devotion, the preux chevalier- most valiant knight, a man who, like one of his liege overlords, Richard the Lionheart, became legend in his own lifetime. Today, exactly 794 years ago, on 14 May 1219, William Marshal lay dying at his manor house of Caversham. Even on his death bed, he never abandoned his fellow knights, for, despite all the honours that had become his part, that is how he must have thought of himself throughout his entire life- he was first and foremost a knight. Thanks to John d'Earley we know that on 13 May, the day before he died, when asked what to do with the rich robes which lay in his wardrobe, the Earl, ignoring his clerk Philip’s suggestion, would have them distributed to his household knights rather than handed over to the Church. “Pentecost is at hand, and my knights ought to have their new robes. This will be the last time that I will supply them, yet you seek to prevent me from doing it” (from The History, in Painter, p.287-88). 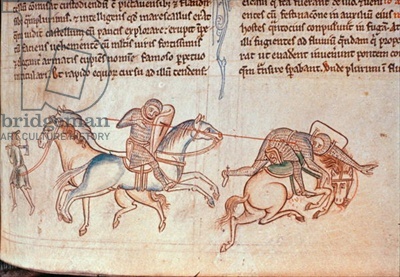 He had already proven that he was as good as his word, for he had been with his overlord, the Young King Henry to the very end, promising to take the prince’s crusader cloak to the Holy Sepulchre in Jerusalem; he had been at Chinon, loyal to the very last moment, when king Henry II breathed his last breath on 6 July 1189; he had faithfully served king Richard, who, among other honours, appointed him a member of a council of regency upon his departure for the Holy Land in 1190 and who, already on his death-bed, designated him the custodian of the royal treasure; and William, as the one of few, did not abandon the “bad” king John and the latter’s minor son in their greatest need: during the First Barons’ War and its aftermath. To sum up, he loyally served the House of Plantagenet from the very moment when he had been taken captive while protecting Queen Eleanor in 1168 (and later ransomed by her) till his last breath on 14 May 1219. His famous biography- the first known biography of a layman dating back to this period- commissioned and written to celebrate his long and eventful life, has become an invaluable source of information, not only concerning William himself, but also all the Plantagenet kings in whose service he remained. I would also like to recommend Elizabeth Chadwick’s brilliant blog, her text entitled Celebrating the Life of William Marshal, and her series Marshal Thursday devoted entirely to… William Marshal. I wish you all fruitful reading! Have read all the books on William Marshall. One of the greatest men in English history yet so often forgotten. Those of us who remain will keep his memory alive. Indeed, one of the greatest men in English history. That's why I'm doing my best to keep his memory alive :-) And since William had been so closely connected with Henry the Young King I'm sure there will be more opportunities to mention him on our blog. Imagine for a moment that William Marshall kept his own secret journals & that they had come to light at some point in history. Imagine what he would have been privy to over those years serving the Plantagenets. I just bought Greatest Knight & Scarlet Lion & hope to read them soon. Thanks for this post, Kasia. Joan, I would be the first to read William's journals, although I'm afraid that he would have been forced to be very "proper" all the time when mentioning the Plantagenets- after all he would have had the journals written by a scribe- as far as I can recall William was an illiterate. I cannot agree more Kathryn. Henry- and his family in general- was lucky indeed to have such a steadfast and loyal friend. One More Time... Invaluable William Marshal.